Old Louisville residents, Jeff Blanchard, Nathan Broom and Jon Coole have formed Oak Seed, Incorporated for the purpose of renovating and managing the 125-year old Meuter complex on the southeast corner of Sixth & Oak Streets. They purchased the vacant structure in November, 2004, and are now occupying and actively working on updating it. The 7,000 square-foot building is comprised of three residential and four commercial spaces, including a 1500 square-foot corner unit previously used as a neighborhood restaurant and tavern. 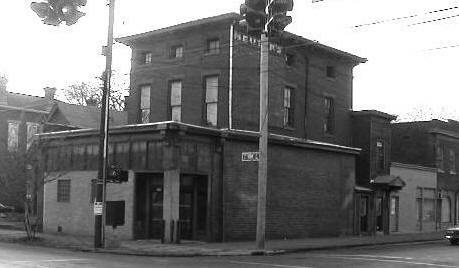 What is now the Meuter building at 530 W. Oak was built in 1880 as a single-family home. The first floor was utilized as an office for various professionals, including doctors of medicine and dentistry. Later, the first floor was expanded to fill the front and side of the lot, adding 600 square feet to its footprint. To accomplish this, the entire north and west load-bearing walls were removed and replaced with steel columns and beams of timber, so that the ground floor would be one large, open space. In 1922, Frederick J. Meuter purchased the building and opened a bakery. He demolished the wooden garage behind the building in 1928 and erected a ceramic block and brick carriage house. He later connected the main house and carriage house with a stucco annex, completely filling the 530 lot. Meuter leased these additional units to such businesses as a cleaners and a beauty shop for many years, and rented out the second-floor carriage house apartments to private residents. His bakery was successful; it was soon expanded into a delicatessen and confectionery, and later into a full-service restaurant. In the mid 1960’s, Meuter retired and occupied the 1203 S. 6th St. apartment above 530 W. Oak, while leasing the latter as a neighborhood tavern. 530 operated as the Old Limerick Tavern until 1978, and was last used by Louisville Chair Co. for chair making and storage; it has remained vacant for almost two decades. Frederick’s son, Walter, who also operated a brokerage and insurance business out of 1205 S. 6th from the late ‘70’s to early ‘90’s, inherited the complex from his father in 1973, which included the adjacent 528 and 526 W. Oak lots. Walter Meuter left the buildings to his son Craig F. Meuter. Craig sold them in 2004 to the current owners. Blanchard, Broom and Coole are presently renovating the adjoining cottage at 528 West Oak, which will be available for lease in March, 2005, and are concurrently clearing out the corner tavern, in anticipation of preparing it for use. They would like to see the space utilized once again as a diner or café, and additionally as a venue for musical performance. Visit www.oakseedinc.com for more information, photos and schematics. The Saint James Court Association has selected Marguerite Esrock as the director of the Saint James Court Art Show. She has served as assistant to the director for the past two years. The association will make a formal announcement and introduction next month. The Mayor and the Metro Council have passed amendments to the Property Maintenance Code which gives Code Enforcement Officers (CEO) the discretion to issue an immediate citation for violations. In the past, CEOs could give notice and a specific number of days to comply. If the tenant or owner did not comply, the CEO could penalize them with a civil penalty or take the case to court for compliance. The process was taking an inordinate amount of the inspector’s time and the violations were lingering because of delays in reinspecting the properties. The new process greatly reduces the time by issuing citations, shortening the appeals time, and emphasizing to the inspectors the expectation that property owners and tenants should know that weeds need to be cut, signs need permits, you can’t park in front yards(grass), etc.. Under the new amendments, the CEO can issue immediate citations for such violations as rubbish, trash, vacant and open property, illegal signs, vehicles parked on grass. The CEO is to use his/her discretion as to whether to issue the citation. The CEO takes into account whether the property has been a re-occurring violator of the Code or if the violation is of such a scale to warrant a citation or if by owner contact, the owner is willing to correct the violation immediately. There is a reasonable expectation on the tenant and property owner to cut their grass, remove rubbish and keep their property to the minimum standards of the property maintenance code. The ability to issue citations anywhere along the inspection process gives the inspector a tool to get the attention of violators. If the citation is uncontested and unpaid, the amount becomes a lien on the property or the tenant is taken to court. If the violation is contested and upheld by the Code Enforcement Board the maximum fine of an additional $100 is levied. In an attempt to speed up the process, the appeal time for violations and citations is now 7 days (formerly 20 days). Higher expectations of tenants and property owners, citations and shortened appeal process will all work to gain quicker compliance and safer and cleaner neighborhoods. Editor’s note: The Code Enforcement Officer for Old Louisville is Michael Baugh. At Community Conversations, Mayor Abramson, department and agency directors and Metro Council members meet directly with you to hear your questions, concerns and ideas. Whether it’s a problem in your backyard or a communitywide concern, Community Conversations are an opportunity to have your voice heard and your needs met. The next Community Conversation is scheduled at 6:30pm on February 28, 2005, at Portland Community Center, 640 N. 27th Street. For a complete 2005 schedule of Community Conversations, access www.loukymetro.org. The Louisville Metro Government website: www.loukymetro.org connects you to government services, community resources, news and events. Find out how to get a building permit or what police district you’re in. Check out proposed ordinances, Get maps of the neighborhood. E-mail the Mayor and Metro Council. MetroTV, Insight Cable Channel 25, provides programs and features, coverage of metro Council meetings, news conferences, and special events. The weekly schedule is online at www.loukymetro.org. Burglary 2- Residential burglary dropped from 11 to 6 reported offenses during the month of January. Four of the burglaries occurred on either Friday or Saturday. This is a change from December when all burglaries occurred during the week and primarily during the day time. Theft from Auto- Increase from 7 reported offenses to 8 in felony category and an increase from 8 to 11 in misdemeanor category. More than half occurred between Thursday and Sunday. Auto theft- Down significantly from 16 to 6. Four of the thefts that occurred during January occurred during the weekend of the January 16. No other patterns noted. Burglary- Dropped significantly from 38 to 19. There were 21 residential burglaries in the Schnitzelburg area and 3 in the Germantown area during the month of December. In the month of January, there were only 7 in the Schnitzelburg area. However in the Germantown area they rose slightly from 3 to 5 offenses. There have been arrests and charges placed in most of these cases. Criminal Mischief to auto- Rose slightly from 8 to 10. Half of the offenses in January occurred on a Friday or a Saturday. This is in line with the usual pattern of weekend activity. Robbery- Dropped from 4 to 2. There is no significant time or geographic pattern. However, the majority involved multiple suspects. Theft from Auto- Felony theft dropped from 14 to 9. During December, 13 of the felony thefts occurred before December 17. Misdemeanor thefts dropped from 14 to 5. The only pattern noted was that 4 out of the 5 misdemeanor thefts occurred on the weekend. TBUT- felony thefts remained steady. Misdemeanor thefts dropped from 12 to 8 with 5 of the offenses occurring during the weekends. The response to last month’s offer for copies of photographs of last October’s Central Park Centennial Dinners and the 2004 Holiday House Tour was underwhelming: zero. Prices have now been drastically reduced: 4x6 and 5x7 color prints can be ordered at the Old Louisville Information Center for $0.29 and $1.29 respectively. Photos are also available for free via e-mail. Visit or call (635-5244) the Old Louisville Information Center for further information. Councilman George Unseld and the 4th Division of the Louisville Metro Police Department invite Old Louisville residents to receive the club, an anti-theft device for vehicles and/or have the VIN number etched on their vehicle’s window on Saturday, February 12, 2005, from 9am until noon at the firehouse at Sixth and Hill Streets. Having a vehicle equipped with a club or etchings usually results in a reduction of up to 15% in insurance premiums. No reservations required. The free clubs and etching will be provided on a first come-first serve basis. Proof of Old Louisville residency required. Old Louisville resident, Samuel Allan Wilson, won first place at the primary level (grades K-3) in a poster contest sponsored by the Jefferson County Teachers Association (JCTA). He was awarded a $100 savings bond at the JCTA annual Dr Martin Luther King, Jr. program at Louisville Male High School on January 27, 2005. “Creating the beloved community” was the theme for this year’s contest. Sam’s poster included twelve separate sketches symbolizing a caring community. Policemen, firemen, and a barbershop were among the images. A copy of the poster is currently on display at the Old Louisville Information Center. Sam, who will turn 6 years old in May, is a kindergarten student at Samuel Coleridge-Taylor Montessori Elementary School. His favorite activities at school are helping younger students learn and Writers’ Notebook, where he can draw and write. Sam lives with his mom and dad, Madonna and Doug Wilson, and his Akita dog, Arata. His interests include basketball, soccer, and baseball. Sam says he loves Old Louisville because it is peaceful and quiet, has wide spaces, and it is where he has lots of friends. He loves flying gliders in Central Park with his dad, and really enjoyed sledding in the park after last December’s snowstorm. 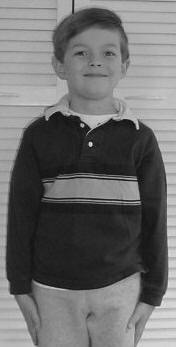 Sam also enjoys playing with his Old Louisville neighborhood friends, Colin, Martin, and Nathaniel. Sam is a community volunteer; he served as a van jumper on both days of the 2004 Old Louisville Holiday House Tour. He made $18.00 in tips for his service in helping people enter and exit the vans. Sam also helps with attaching mailing labels to copies of the Old Louisville Journal. He often visits the Old Louisville Information Center. Taking after his mom, a design architect, and dad, an architect, Sam wants to be a builder and architect when he grows up. The Filson Historical Society has scheduled two lectures for February at the Society’s headquarters, 1310 South Third Street. The lectures are free and open to the public. Call 635-5083 for reservations. As many as 20,000 women worked in Union and Confederate hospitals during America’s bloodiest war. Black and white and from various social classes, these women served as nurses, administrators, matrons, seamstresses, cooks, laundresses and custodial workers. Jane Schultz provides the first full history of these female relief workers, showing how the domestic and military arenas merged in Civil War America, blurring the line between home front and battlefront. Schultz uses government records, private manuscripts, and published sources by and about women hospital workers, some of whom are familiar – Clara Barton, Louisa May Alcott and Sojourner Truth – but most of whom are not well known. Examining the lives and legacies of these women, Schultz considers who they were, how they became involved in wartime hospital work, how they adjusted to it, and how they challenged it. Schultz is associate professor of English, American studies, and women’s studies at Indiana University – Purdue University – Indianapolis. Step back into the early 1940s, a time when you could buy a Coca-Cola for a nickel, go to the movies for 25 cents, tune in to Jack Benny on the radio, and listen to Hoagy Carmichael’s “Stardust.” This touching narrative of a young Kentucky couple’s wartime romance is recorded in more than 700 letters with the revelation of its tragic end on June 6, 1944, chronicled in the bereaved widow’s diary. A son’s 20-year emotional journey to “find” the father he never knew completes this poignant tale. Hugh Ridenour is a historian and author from Hanson, Ky. This program is funded in part by the Kentucky Humanities Council, Inc. and the National Endowment for the Humanities.